Custom colors and wraps are subject to additional charges. Please see your Dealer for pricing. We reserve the right to refuse customization for any reason. Our Grab Handles are a must for all serious riders. 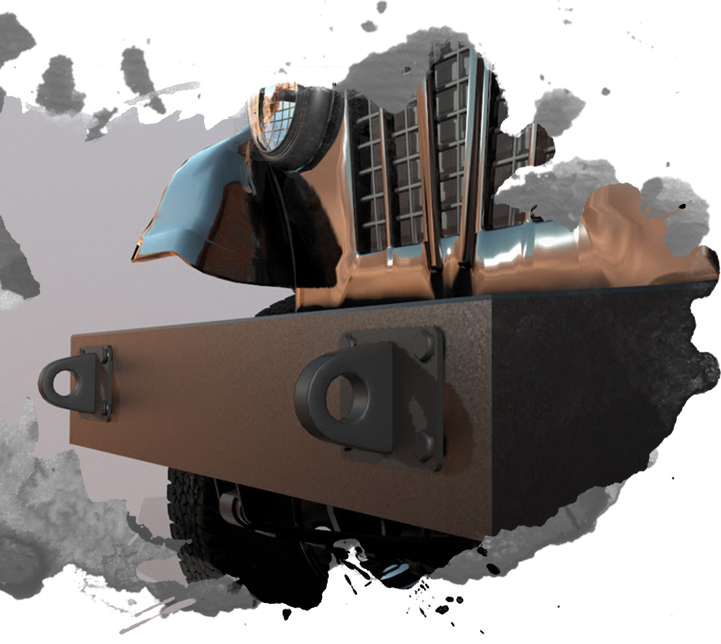 Another tough accessory that helps to complete the ROXOR package, these resilient, removable handles are designed to simplify ingress and egress and offer added security when traversing rugged terrain. Crafted with heavy-duty nylon and industrial Velcro, these handles feature a triple steel-ring fastening system to ensure consistent positioning. This no-nonsense combo ensures your ROXOR is able to go face to face with any obstacle on the trail. Our 11-guage, 1008/1010 cold rolled steel bumper features a simple 8-bolt attachment to make integration a cinch. 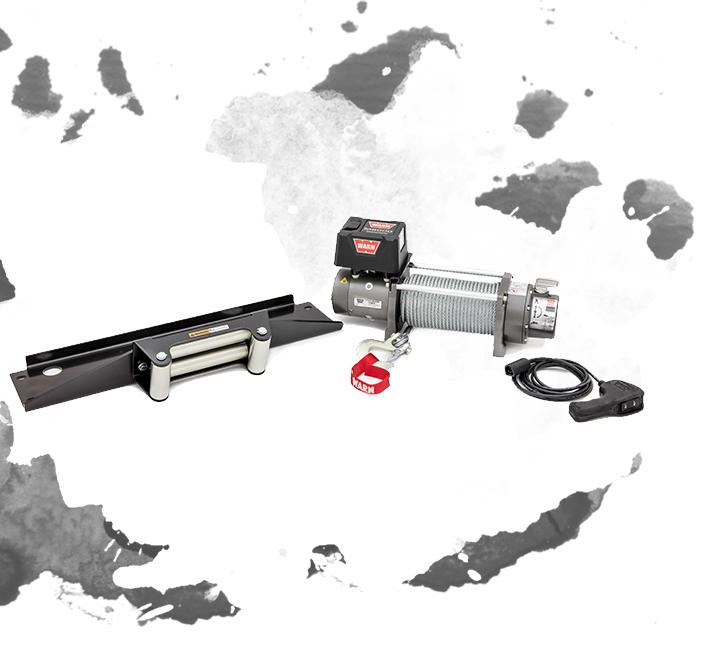 The accompanying Warn winch makes this package a must-have for every owner who plans to push their ROXOR to the limit. 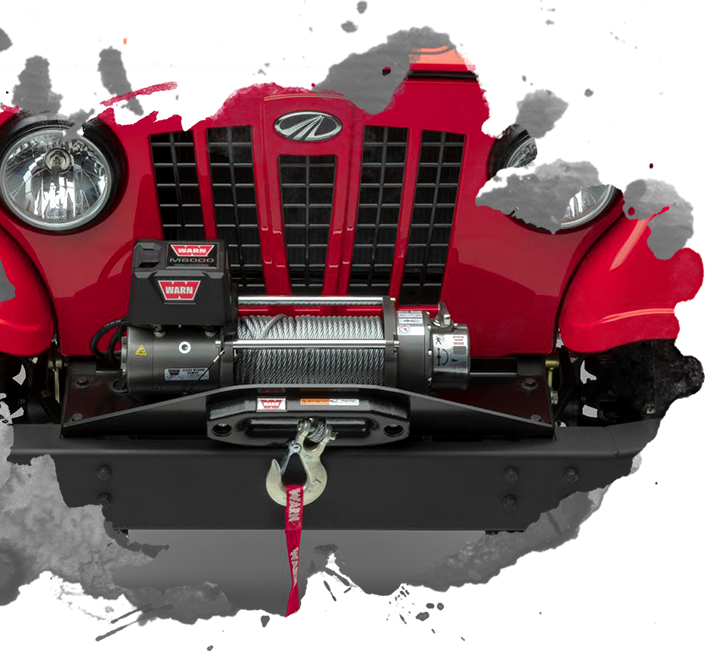 This exclusive winch from the recognized leader in the industry is engineered specifically for our heavy-duty bumper package and boasts an 8,000 pull capacity and 12V DC motor. This package adds yet another rugged dynamic to ROXOR’S workhorse DNA. Up-level AGM battery sold separately. Strongly recommend Exide AGM group 24 battery. This battery fits best in the vehicle and is available separately through an authorized ROXOR dealer. Only Exide brand battery has been confirmed to fit appropriately, use of non-Exide brand battery can pose a potential shorting risk to the battery terminals installed. 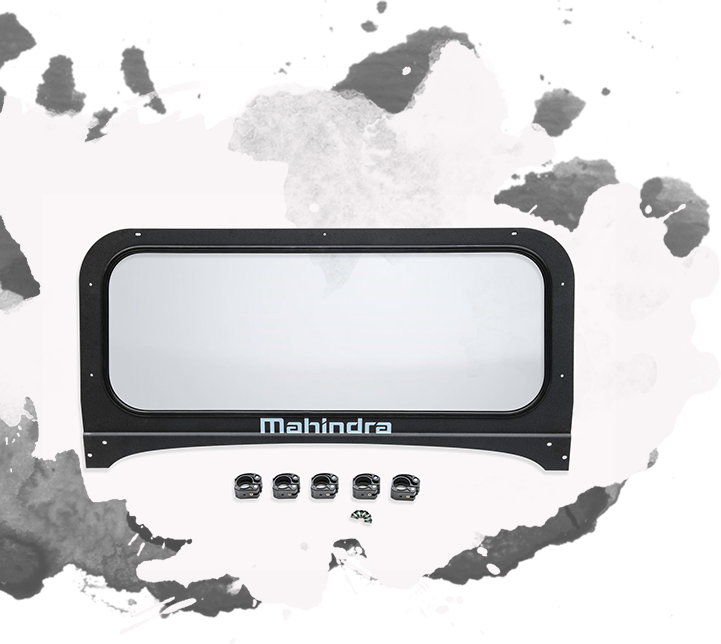 Improve visibility and make sure you know what’s coming with these shatter-proof, tempered glass mirrors. 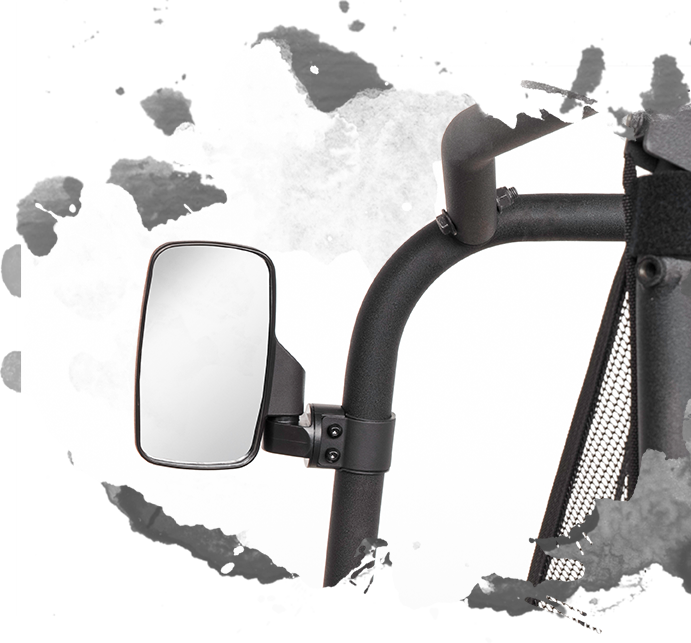 Engineered specifically for this vehicle, these mirrors are designed to work with ROXOR’S ROPS system and come equipped with high-impact ABS housing and break-away feature (side mirrors). 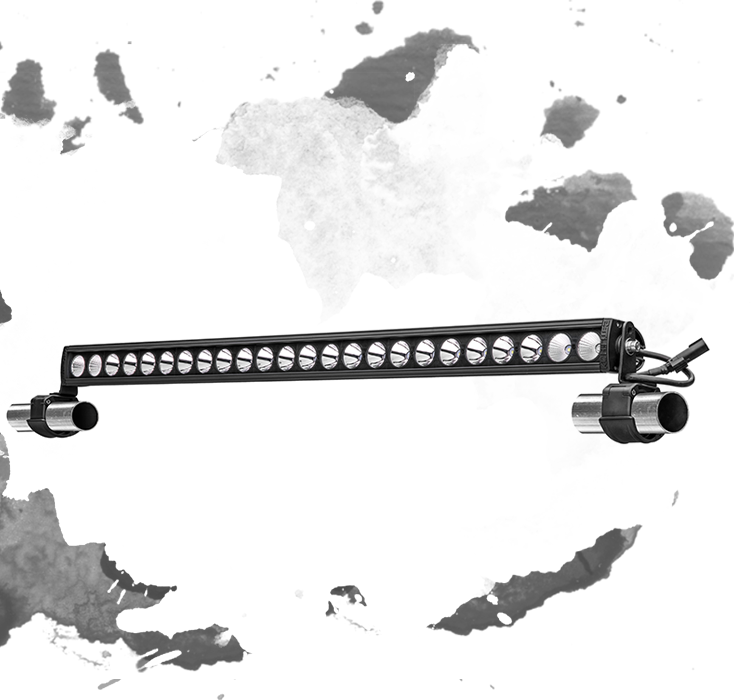 Chase away the dark with this 150w, 24-lamp LED light bar from one of the most trusted component suppliers in the Side x Side industry. 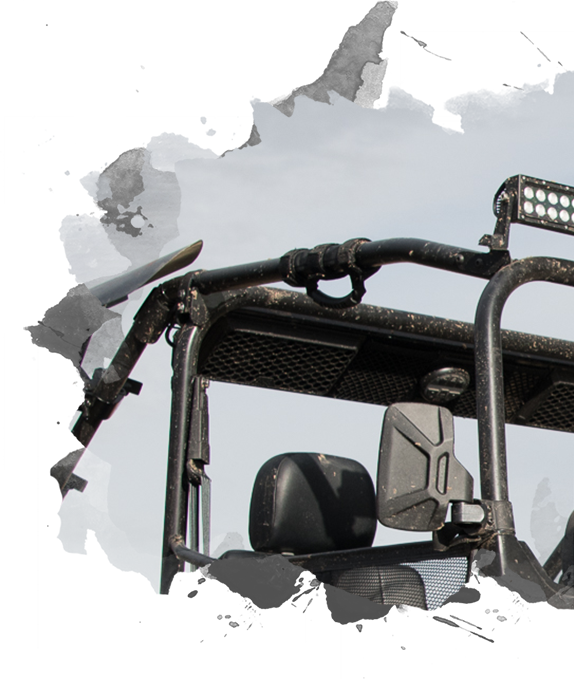 Specially adapted to fit ROXOR and integrate with both its wire harness and bikini top (above), this KC light bar features a lifespan of up to 50,000 hours and is optimally resistant to dust, shock and vibration. Superior in efficiency and optics this light bar gives you the freedom to ride past sunset. 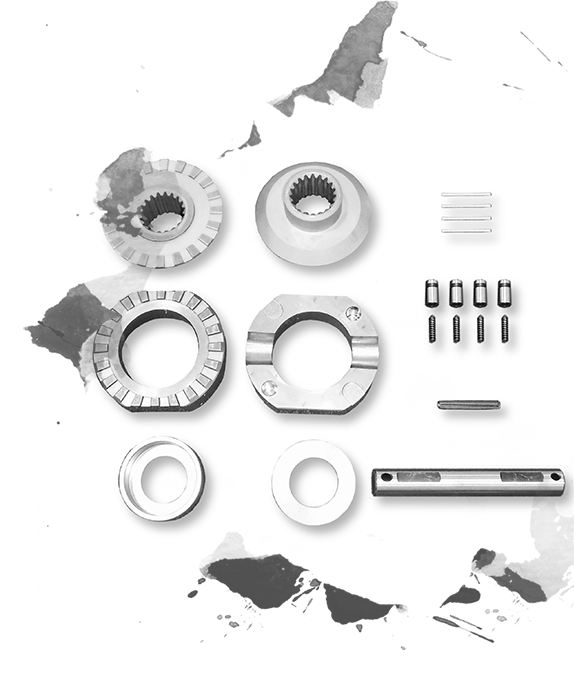 The ROXOR Locking Differential kit won’t steer you wrong. 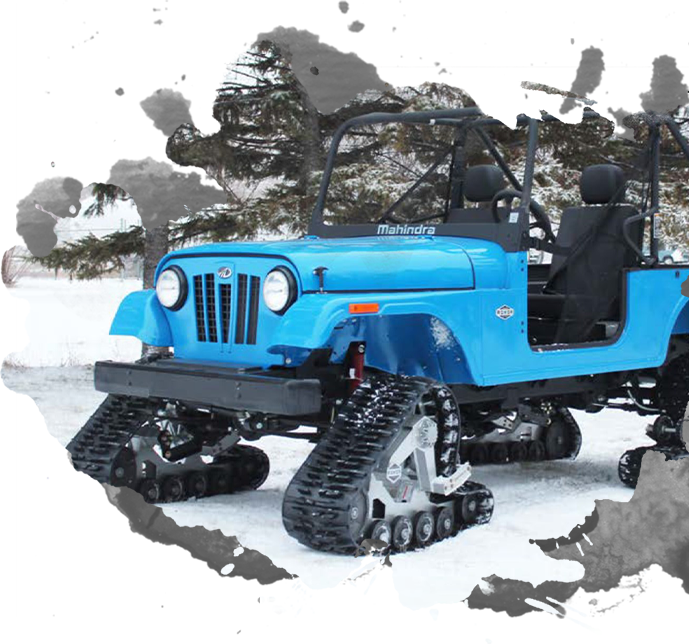 Developed together with OX, this Made in the USA kit has everything you need to maximize off-road traction including: OX's torque locking side gear, cast differential cover, electric shifter with 48” cable and ROXOR specific gear bolts, side gears and spacer. 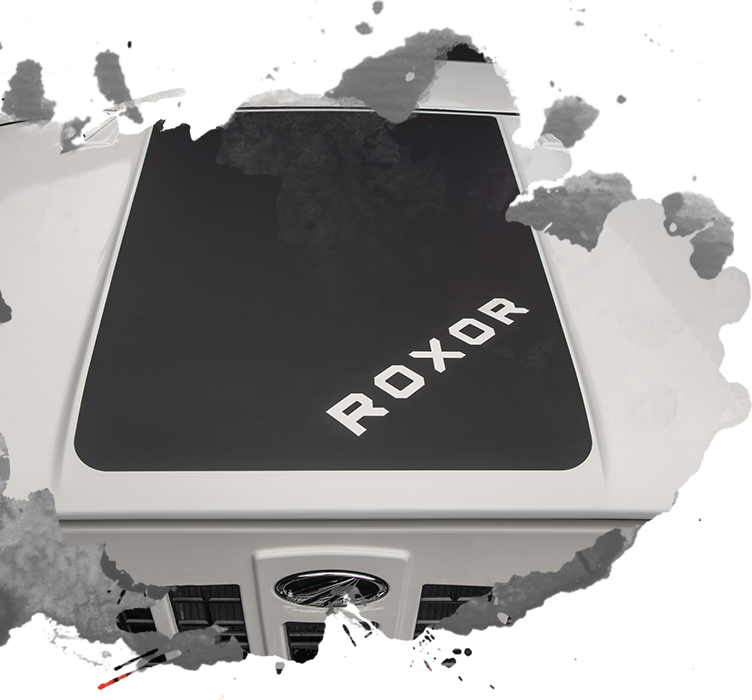 Made of the finest tin known to man, you will be the envy of the trails with the official ROXOR branded custom plate. Buy 2 for the front as well as the rear! ROXOR HD dual hitch to hook up and haul a real load. ROXOR can tow up to 3490lbs! Easy to install and a fully functional kit for that heavy-duty haul. Lock the hubs in and be confident to play extra hard in the mud, dirt and sand! 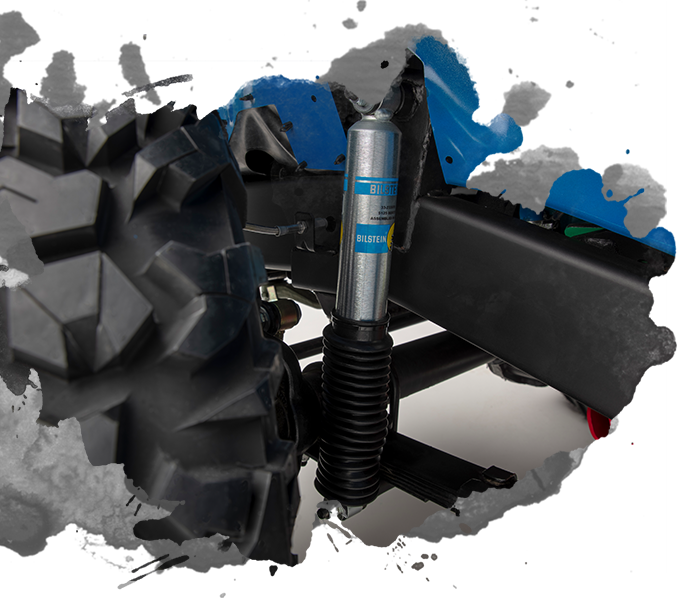 Easy install, manual operation for positive traction in the most demanding terrain and conditions! Stay dry, clean, and warm when you need it! 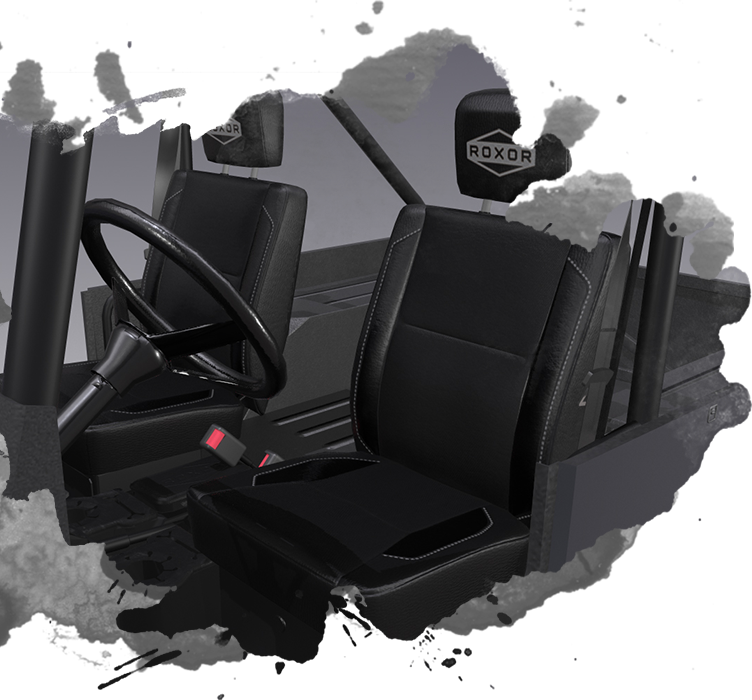 You’ll run your ROXOR through some tough terrain…be sure to protect you and your passengers with a soft full cab enclosure. Your washing machine will thank you. Front windshield required, sold separately. 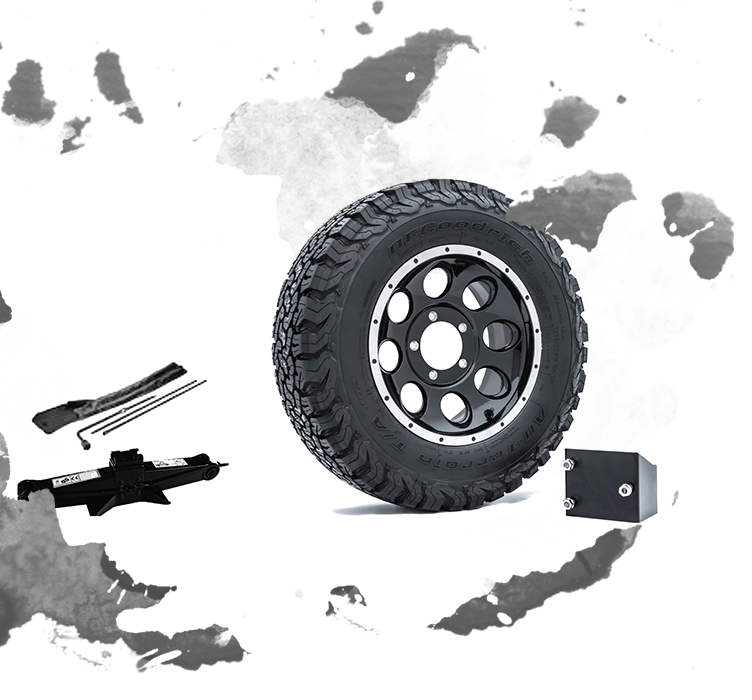 Rounding out our offering of spare wheel and tire kits, we have added 8 more combinations to compliment all vehicle configurations. A total of 12 kits are now available and include an easy to install mounting bracket, a lock to keep things secure and a 2-ton scissor jack with tools & storage bag. For added piece of mind as you cut through even the roughest trails, order yours today. Don’t forget to add a Spare Tire Cover (see below). You will want this sturdy one-piece roof system. Made of rugged, textured thermoplastic polyolefin (TPO), the top measures 62”x 56”x 6.5”, weighs approx. 35 lbs. and includes attachment hardware. 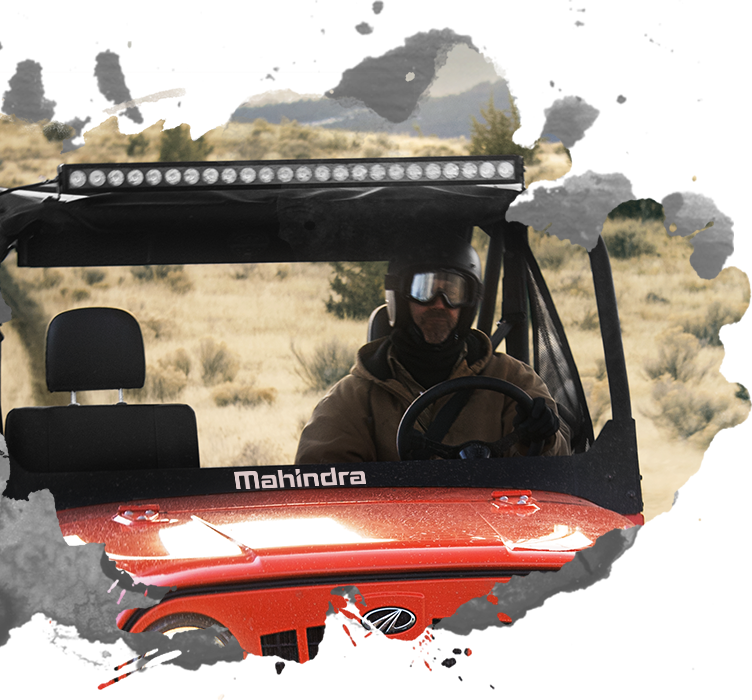 Using military-grade LEXAN™ MARGARD™ material this single-sided, hard-coated polycarbonate windshield provides both optimum abrasion-resistance and crystal-clear visibility on the trail. Don’t let gravel, rocks or limbs spoil your ride, stay confident and protected behind one of the toughest windshields in the industry. 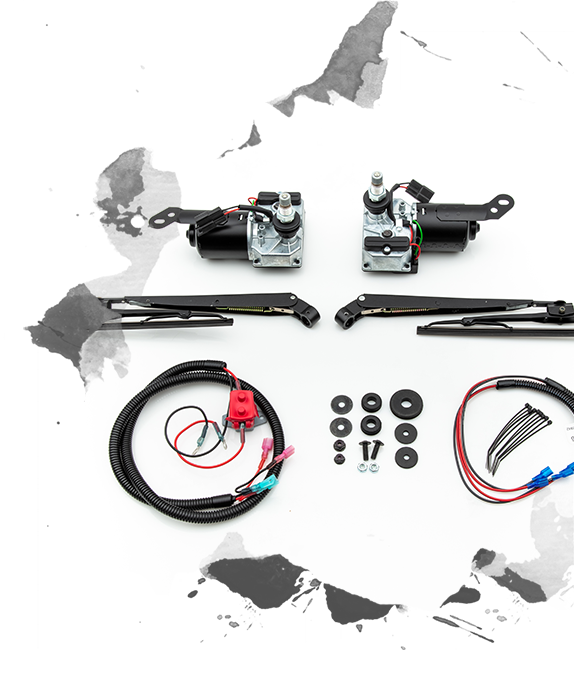 This Kit comes with EVERYTHING you need to warm you in your ROXOR including: heater core and fan, heater hose, hose splicers, hose clamps, mounting bolts/brackets, switch & wiring. These heaters are manufactured in the USA and have 16000 BTU’s! 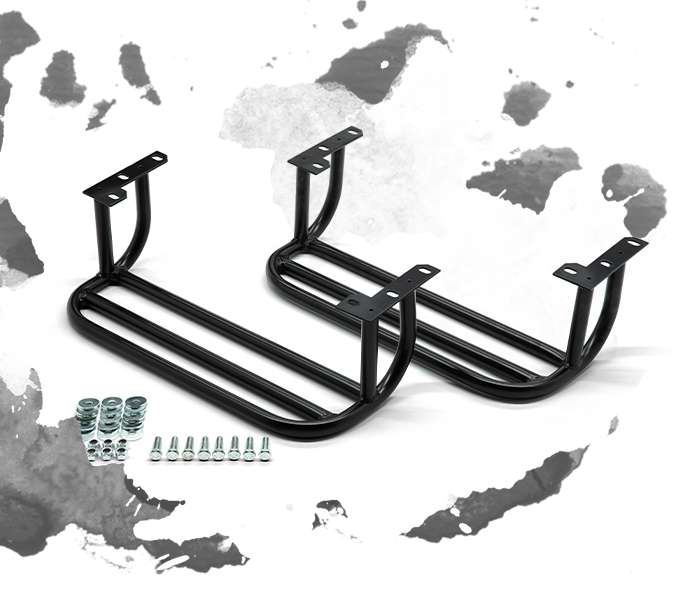 Stay protected when pushing your ROXOR to the limit with this custom-made skid plate. 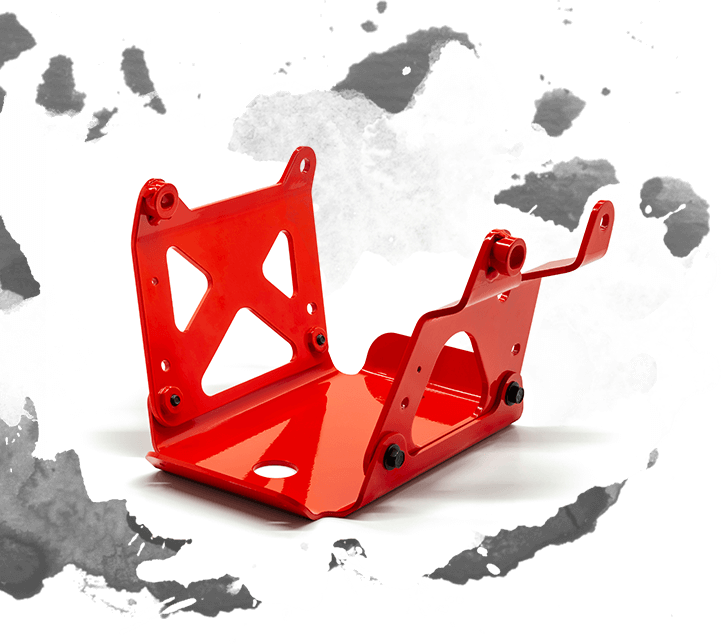 Armor for your oil pan, this plate is made from 6061 T6 aluminum and comes painted in a durable “Mahindra” red powder-coat finish. Skid plate will mount to existing engine block locations while preserving drain-hole accessibility. 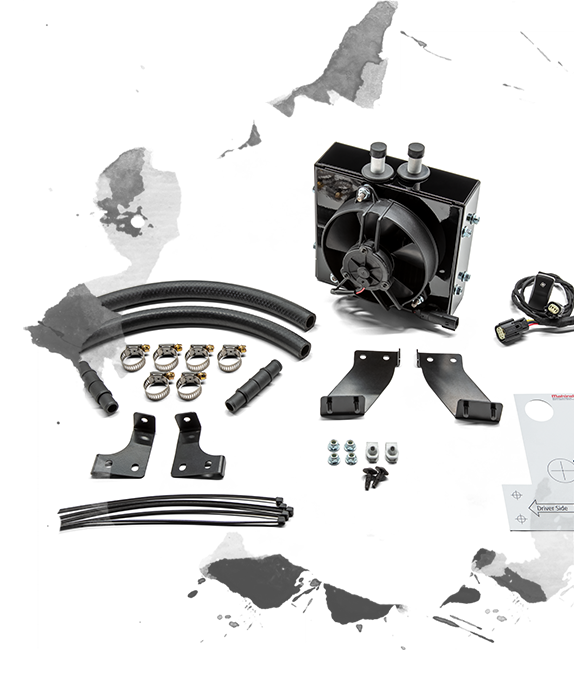 The 3-piece kit comes will all fasteners and includes mounting access for sump heater cables. 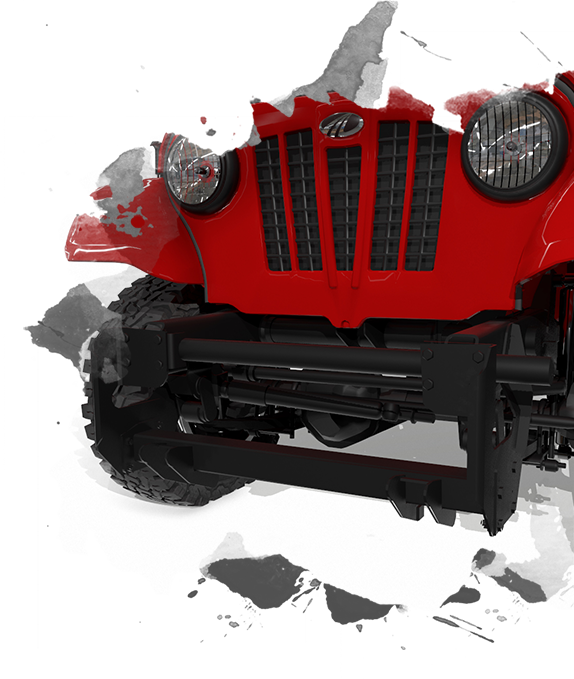 Be ready for even the roughest terrain with our up-level bumper and stinger bar package. 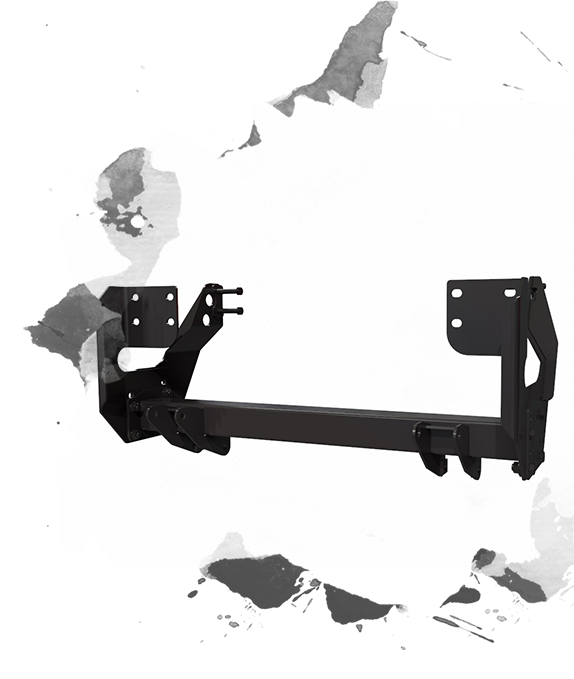 This “tusk” for your ROXOR is made of heavy-duty steel and comes with a kit that includes a mounting plate and all fasteners to mount to existing body locating points. Dark and distinctive, this black hood stripe both elevates the style and adds an element of “bad” to your ride. Featuring the ROXOR logo in its lower left-hand corner this graphic can be professionally applied at your local dealer or ordered directly from the factory. 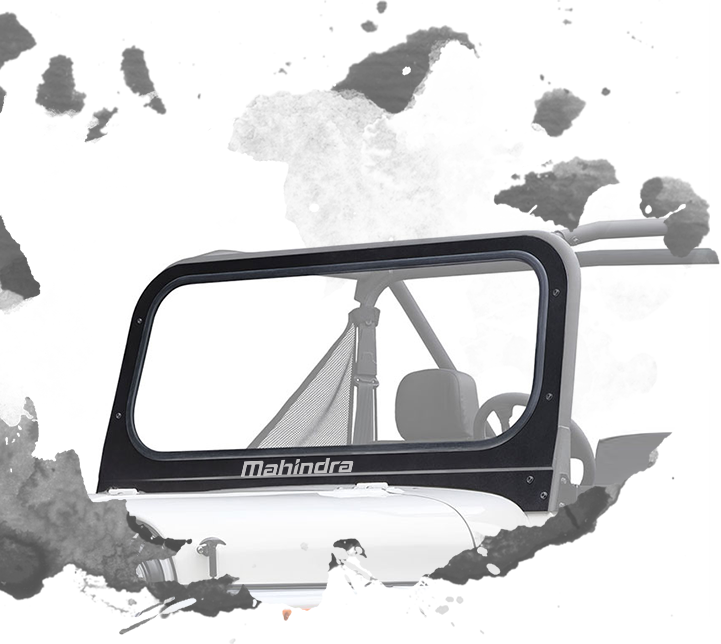 Set your ROXOR apart with this coolly-defined grille painted in matte finish to perfectly contrast vehicle finish. 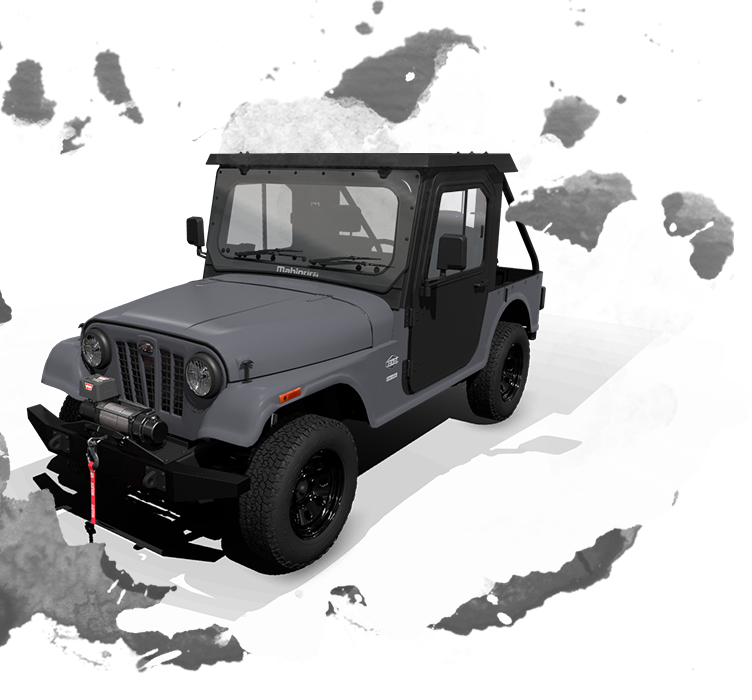 Pairing this matte grille with Real Tree or Mossy Oak Break – Up graphics creates a cohesive and dynamic combo suited for any adventure. 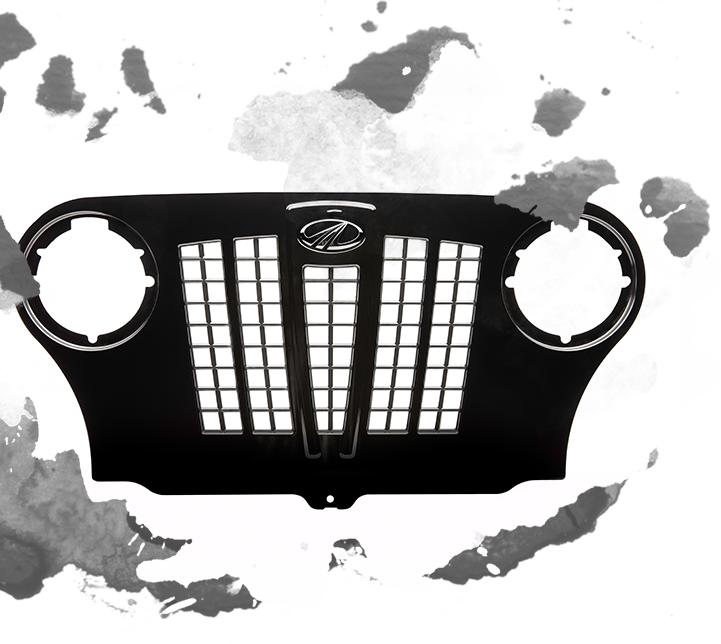 This grille is a favorite of riders seeking an added touch of dark style for their ride. Our matte finish has been formulated to expertly contrast your vehicle’s body finish to create a two-tone look sure to turn heads. 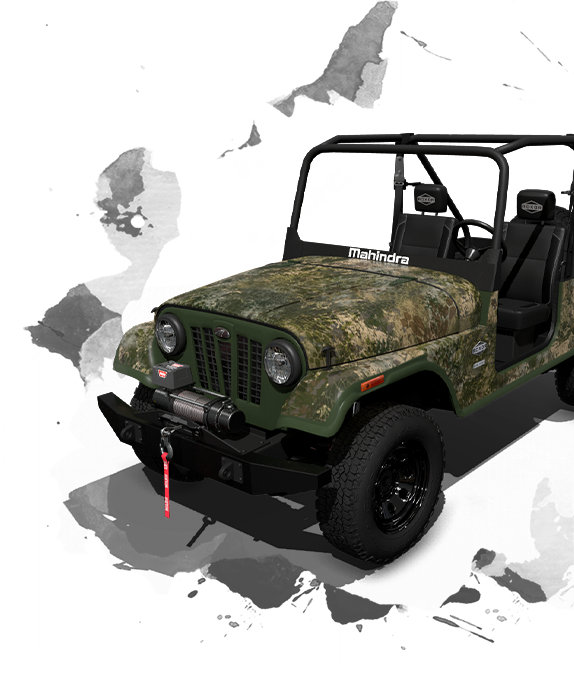 For added effect pair with Real Tree or Mossy Oak Break – Up graphics. 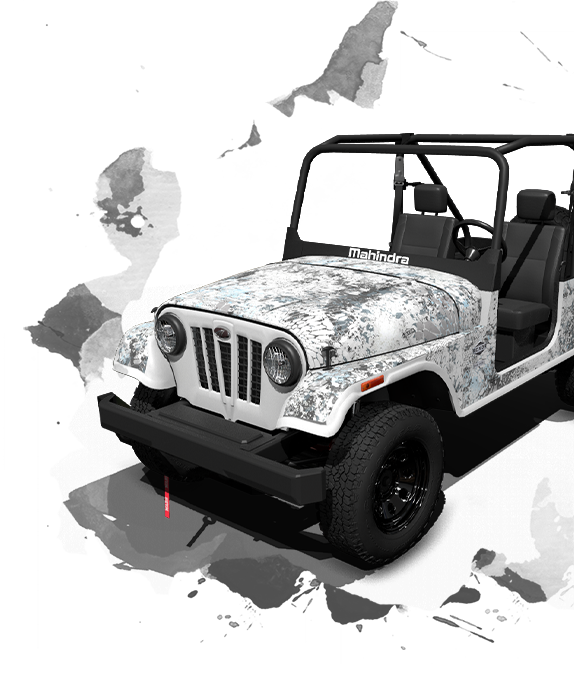 Be sure to disappear completely into the forest with this camo grille. Crafted specifically to complement your full camo ROXOR, this grille finishes off a package that will make your ride all but invisible. Available in Real Tree and Mossy Oak Break – Up. 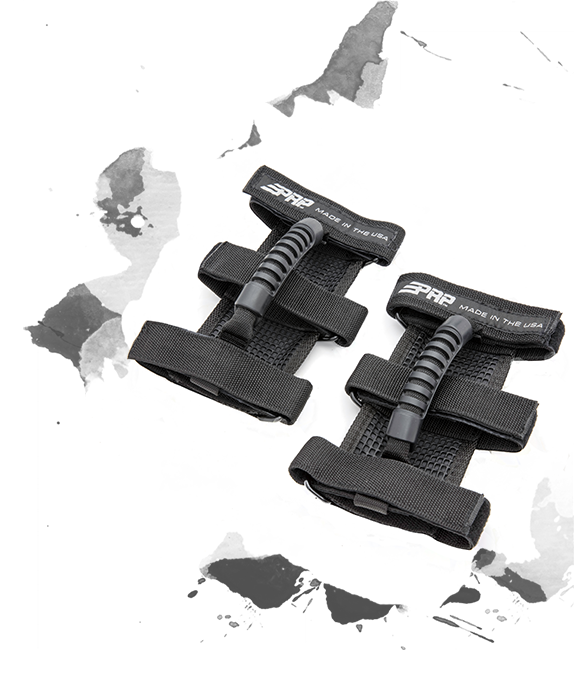 From an off-road accessory provider with a reputation for superior strength and toughness, these Kolpin Rhino grips feature rubber, over-molded heavy-duty nylon, offer up to 15lbs of carrying strength, and can be quick-mounted to your ROXOR’s diagonal ROPS system. Accompanied by hardware and mounting plates, these grips (2) have a 360 ° base—tilts 160° in 40°—and can be easily removed when needed. From crossbows to fishing poles, to shovels and farm tools, these grips ensure your gear isn’t going anywhere, even if your ROXOR is. For an added reminder to anyone on your ROXOR’s tail, be sure to outfit your ride this “DDAS” spare cover. For both added style and advice that never gets old, order this exclusive ROXOR cover. Get out of tough spots and make your ROXOR even more capable with these mounts made from 1010-1018 cold-rolled steel (CRS). 20 mm thick pivot plates welded to 10mm mounting plates these D-ring mounts come in a black powder-coat, semi-gloss wrinkle finish and are made specifically for ROXOR’s up-level bumper. With a sub 30-minute install time, you can bolt these mounts to your ROXOR’s box frame (using the included MI10 fasteners) and be ready to hit the trail in no time! One of the longest running myths about military vehicles is the idea that somewhere, somehow you could buy a vehicle in a crate for $50. This idea has been around now at least since WW II. 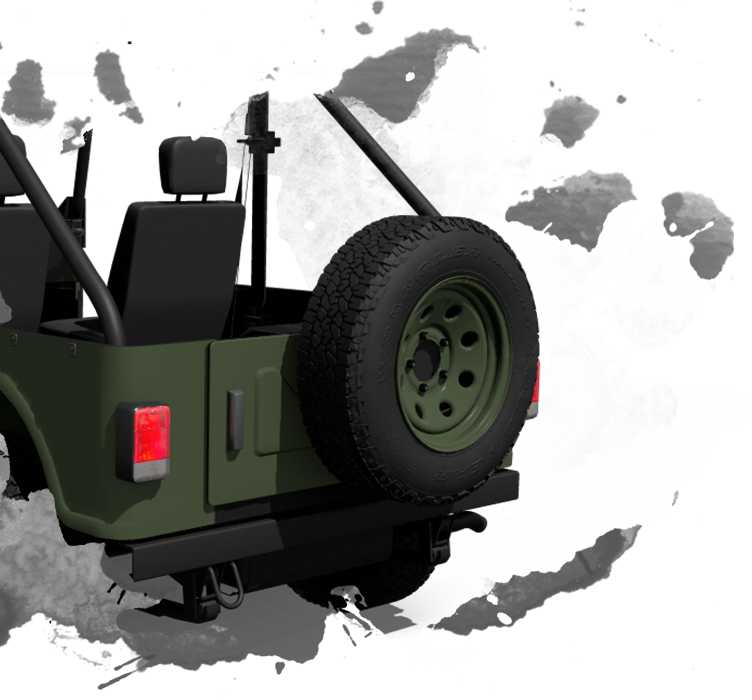 Now is your chance to make that myth a reality with the new modern day ROXOR off roader, configured with this Military package. 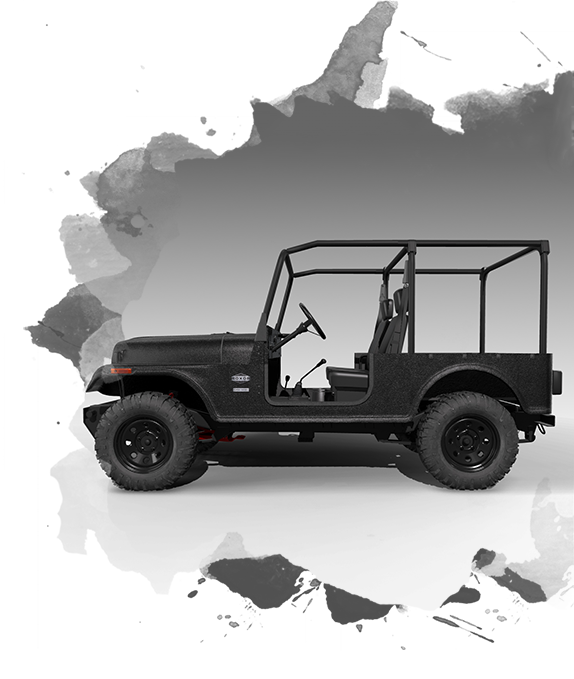 It has the look of the past with the toughest chassis and powertrain offered in any off road SXS today. 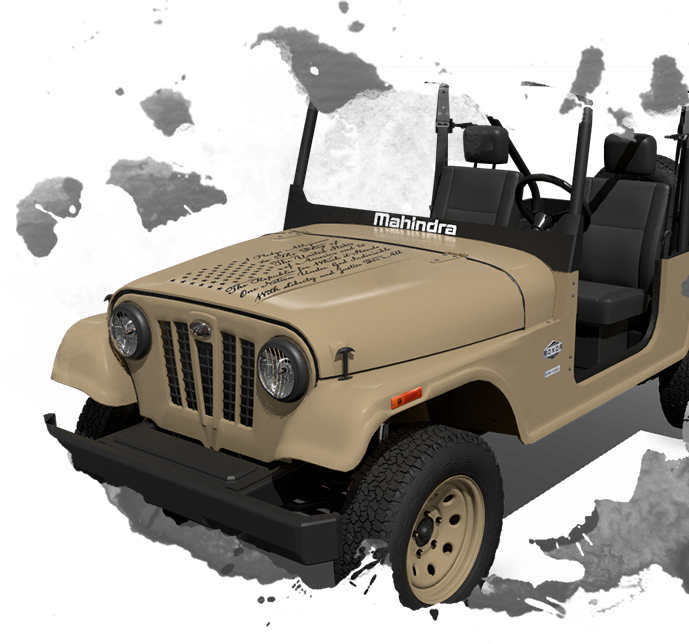 This package boasts a military theme complete with tire pressure decals over each tire, just like the original that Mahindra built in the 40’s and 50’s! 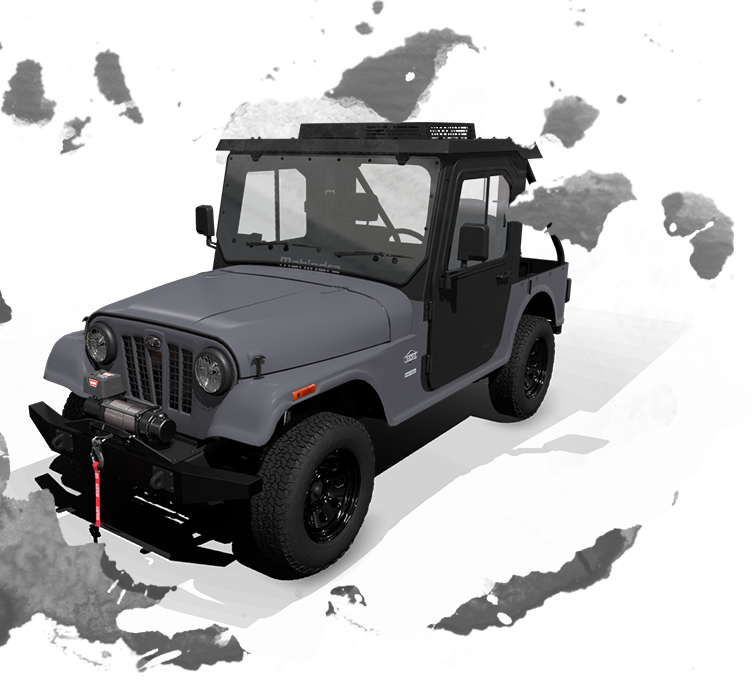 Configure yours today at roxoroffroad.com! Crate not included. 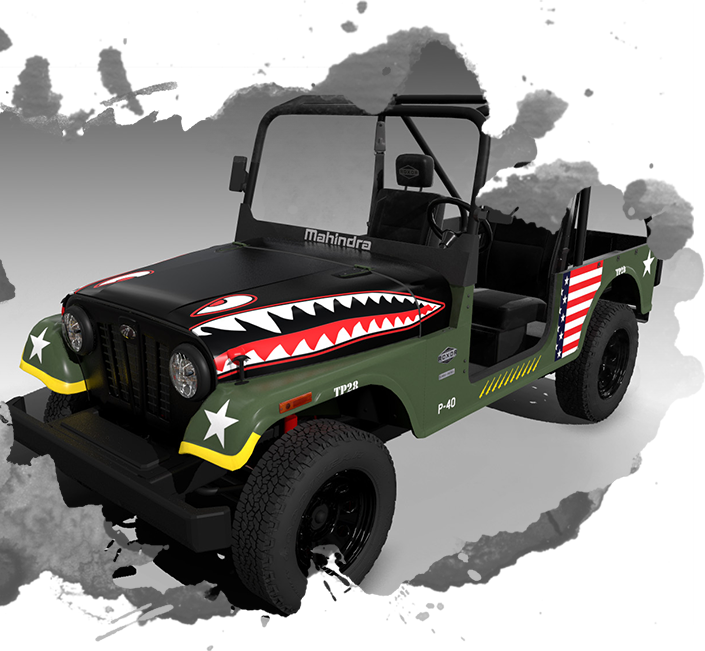 These fierce graphics are styled after the Curtiss P-40 Flying Tiger World War II plane and will transform your ROXOR into a visually distinctive, attention-grabbing beast. Uncage the Tiger and let it feast on the trail! 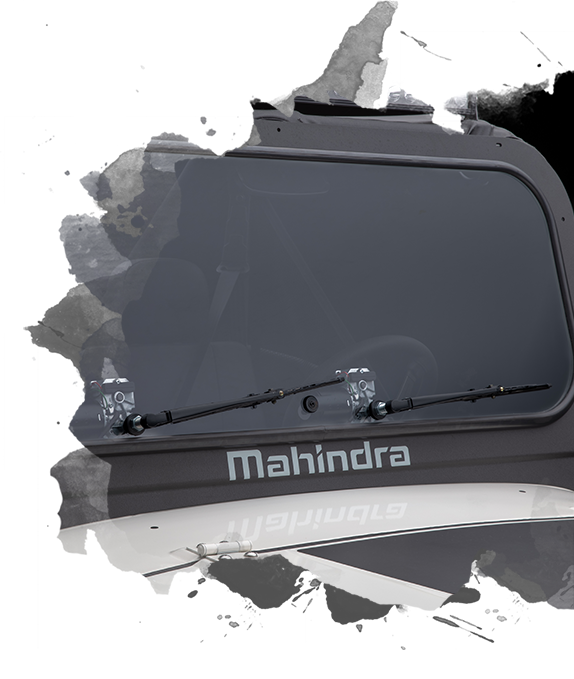 Dual wiper system developed specifically for our Lexan MR 10 polycarbonate – hard coat windshield. Comes with robust 12 V motors with integrated on/off switch for independent control. Kit comes with wire harness, locating template, all necessary fasteners and instructions for a professional installation. 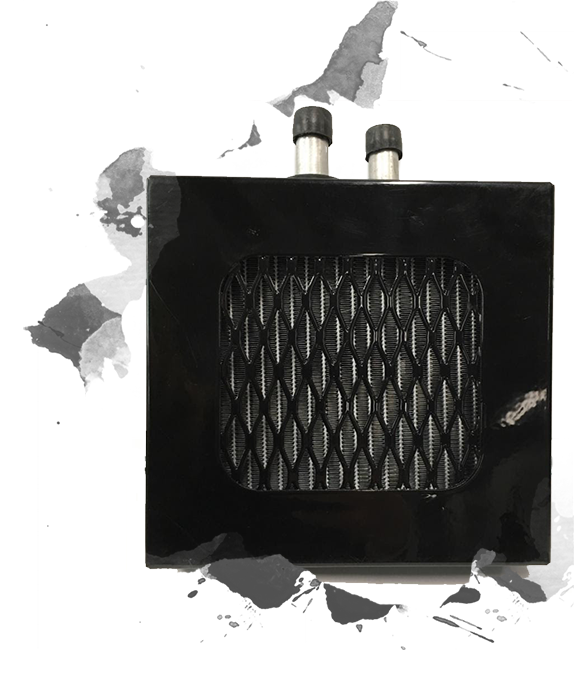 The Ultimate ROXOR Accessory for your soft cabin enclosure and heater is our new Defroster kit. The Defroster kit allows to control the climate inside the cab with adjustable floor vents and a big sweeping windshield vent to help keep your windshield clear. (Heater sold separately). 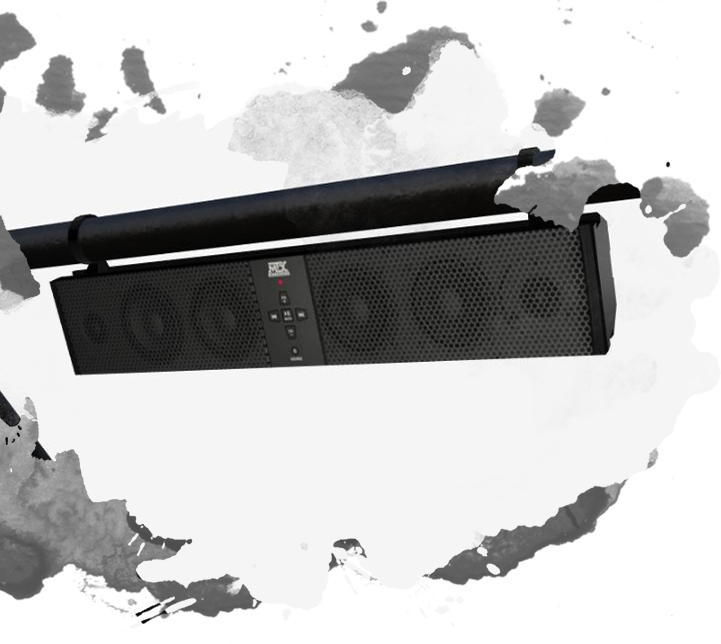 The ROXOR/MTX universal 6 speaker all weather sound bar with Bluetooth is an outdoor, weather-resistant, and super-rugged universal solution that is designed to deliver exceptional audio quality to your ROXOR. This all-in-one unit includes six total speakers. 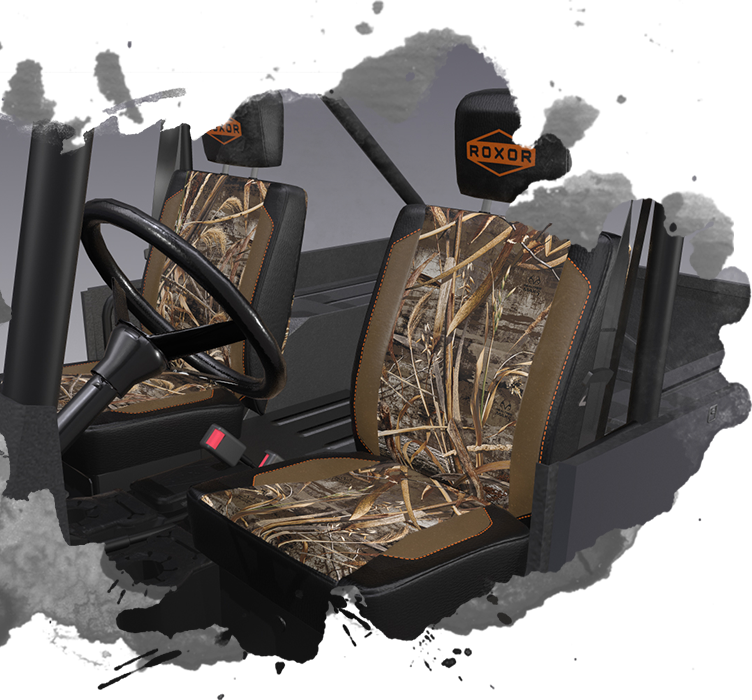 Your new ROXOR MTX easily washes off when you’re done having fun in the mud. 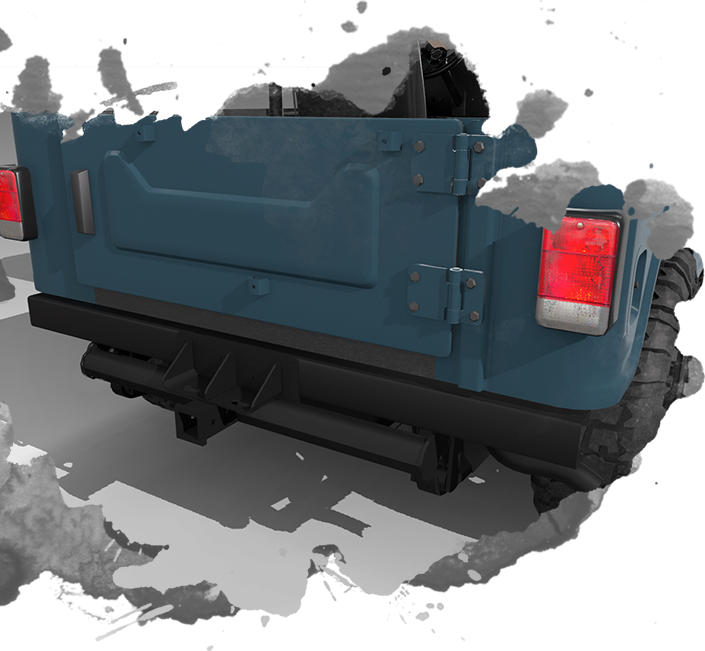 Get ready to haul that big load with ease – ROPS available for the rear cargo area helps contain the haul when you’re loaded up. Easy to install and comes standard with ROXOR strength. Available as accessory or factory install. Long durability, and the control you need even in rough terrain. The Roxor Specific BILSTEIN shock absorber offers BILSTEIN’s legendary monotube gas pressure design and world class performance for high driving dynamics and a perfect off-road experience. Pricing includes kit of 4. Available as accessory or factory install. 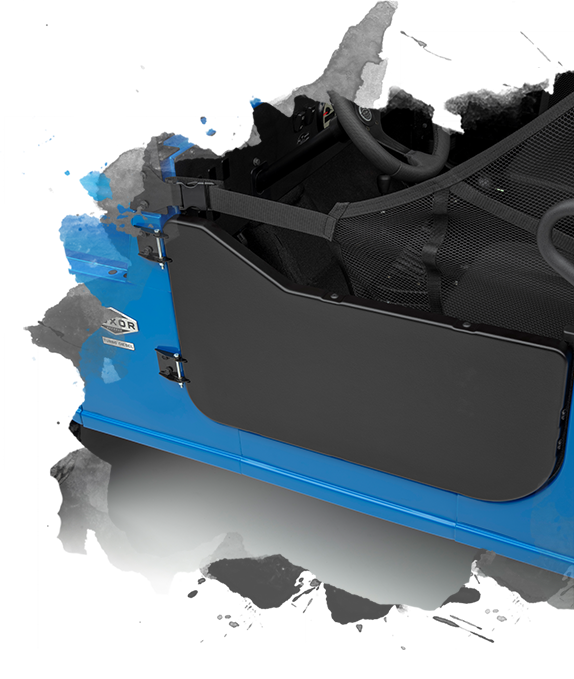 These solid half doors are black powder coated and have a durable steel frame structure. They include an Interior molle panel for mounting storage accessories and an exterior UV protected black ABS panel with textured finish. The doors also have a wide opening for ease of ingress / egress, an easy to use pull latch requiring no vehicle modifications, and hinges designed to easily mount to the holes currently on the ROXOR. The splash guard is quick & easy to install and the exterior panels are easy to attach & replace. Available as accessory or factory install. 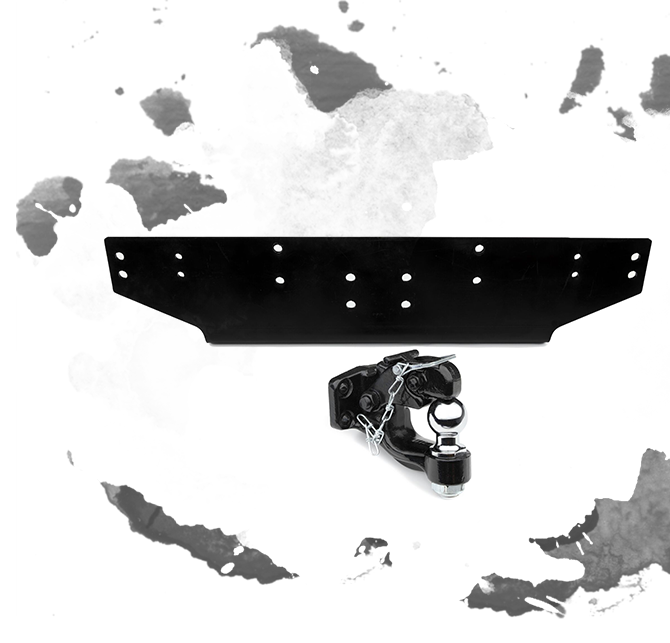 ROXOR has teamed up with Meyer and KFI plow systems to provide a bolt-on snow plow mounting kit designed for fast and easy installation. Using a simple, mechanical, bolt-on system, this kit comes complete with blade mount and fasteners. The system is designed to fit exclusively with Meyer and KFI blades, compact and easy to install. All you do is choose your blade and you have all you need to maintain the winter snow! Professional installation required. Wire unroller. Think of this as a part that allows you to mount a big spool of barbed wire fencing and as you mend a fence, it unrolls the wire as you drive along the fence line. Tow behind salt spreader, fertilizer spreader, mower, etc. Hitch mounted cargo carrier (you see them attached to the back of vans and SUVs carrying luggage or coolers…). Max trailer weight: 3500 lbs. Max tongue load: 349 lbs. Max vehicle tow speed: 15 mph. 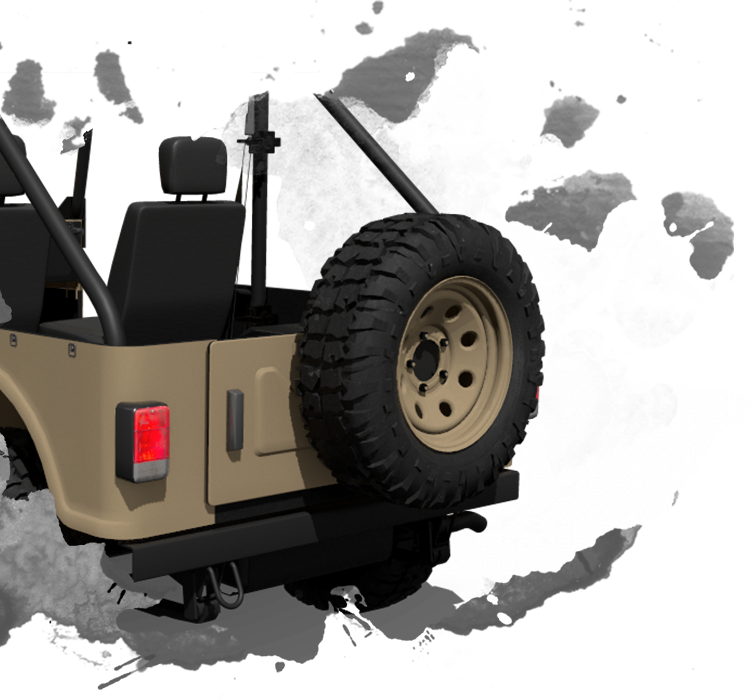 Specifically designed for the ROXOR with numerous patented features including rubber torsion and torque suspension as well as track and tread design. 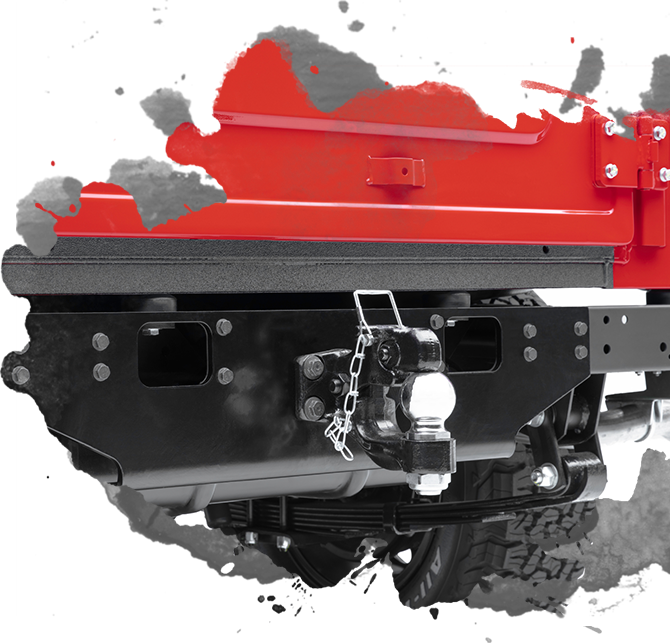 The zRX is a true all terrain track system that provides optimum vehicle clearance while keeping the track system centered on the axles. 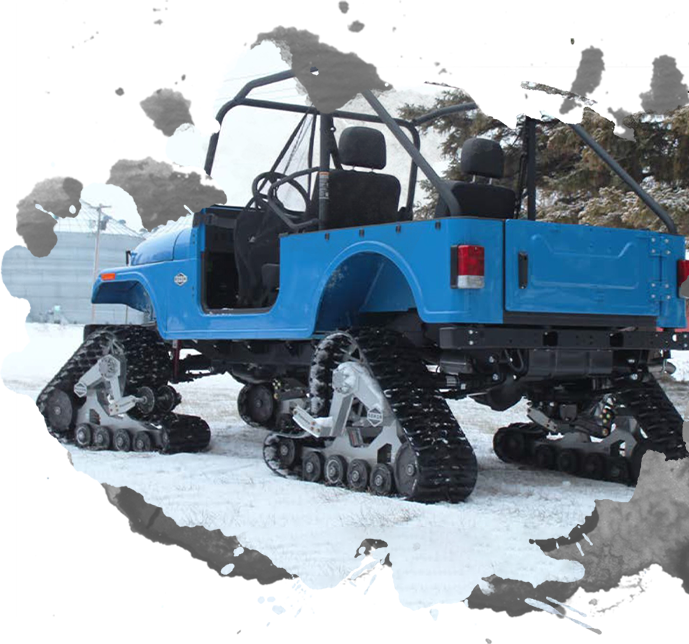 The ROXOR with the zRX improves traction, ground clearance, reduces compaction, and provides improved flotation for soft terrain. 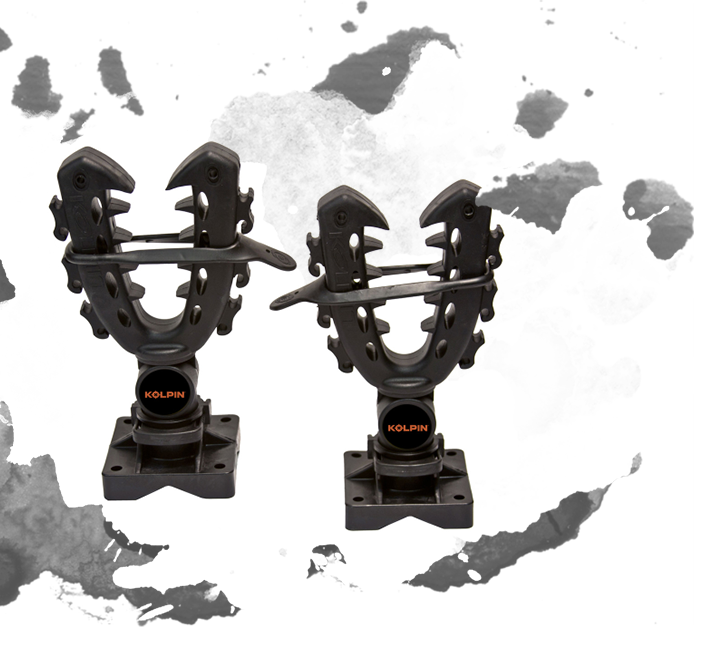 Built to be ROXOR tough, the Mattracks zRX Rubber Track Conversion System is proudly engineered, designed and built in the U.S. Please note, only operate with open front differentials. The OX locking differential in the rear is acceptable. Do not operate with front lockers, disconnected front hubs or lunchbox lockers of any kind. Periodic monitoring steering system bolt torques is recommended. Static steering on pavement should be avoided. Order lead time is 6-8 weeks. Visit http://mattracks.co/tracks/zrx/ for additional specifications. Full Hard Cab with AC and Heat pictured. Full Hard Cab Enclosure pictured. Durable, rust proof aluminum construction. 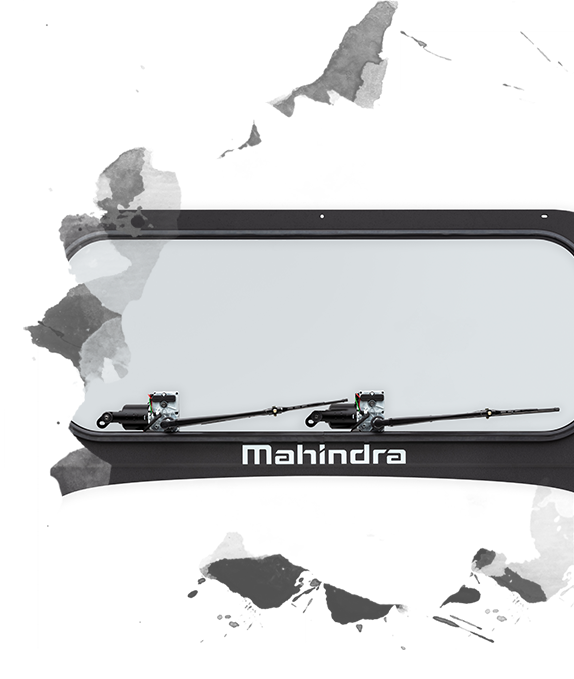 Quantum coated polycarbonate venting windshield with robust dual wiper and washer system. 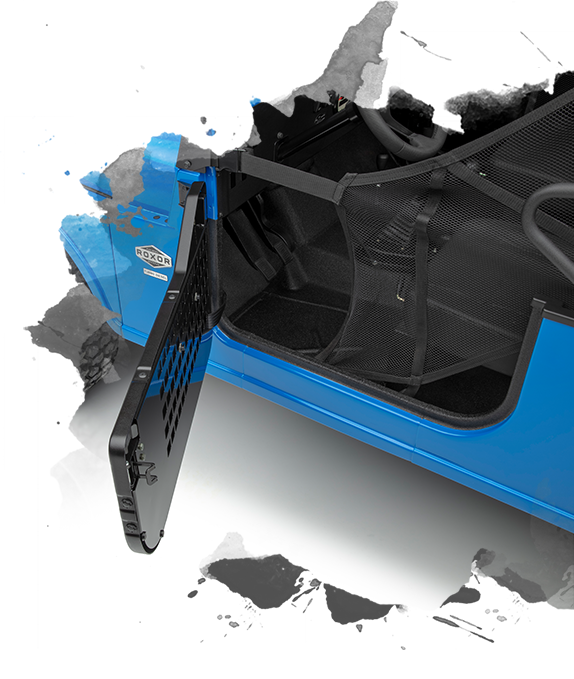 Hinged doors with automotive-style lockable latches, safety glass sliders and heavy-duty gas struts. Rear panel features a large safety glass window for expanded visibility. Stylish, low-profile rooftop A/C System with enough clearance to park in most standard garages. A/C system is self-contained and powered by an auxiliary 135 Amp alternator that puts out 12,000 BTUs. 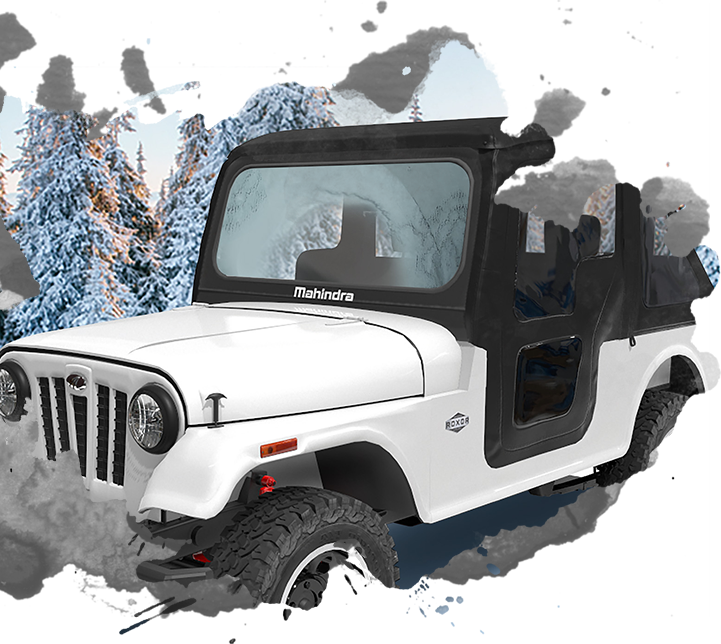 Optional 20,000 BTU under-dash heater kit with two 360-degree adjustable upward facing louvers for full windshield defrost. 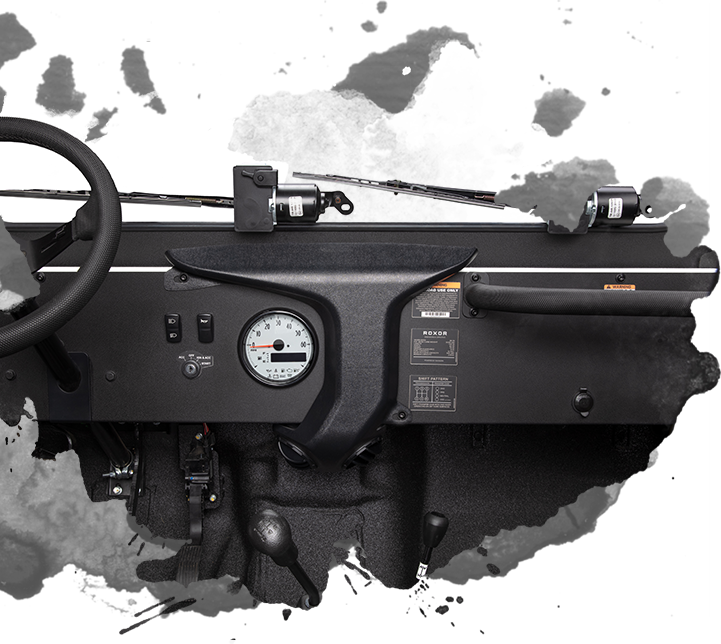 Two additional adjustable downward facing outlets provide even heat distribution throughout the cab. 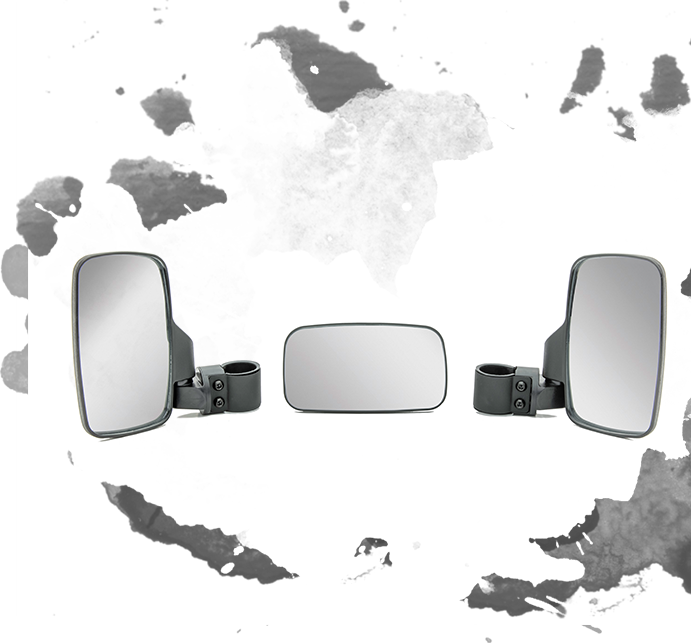 Interior and exterior side view mirrors standard. 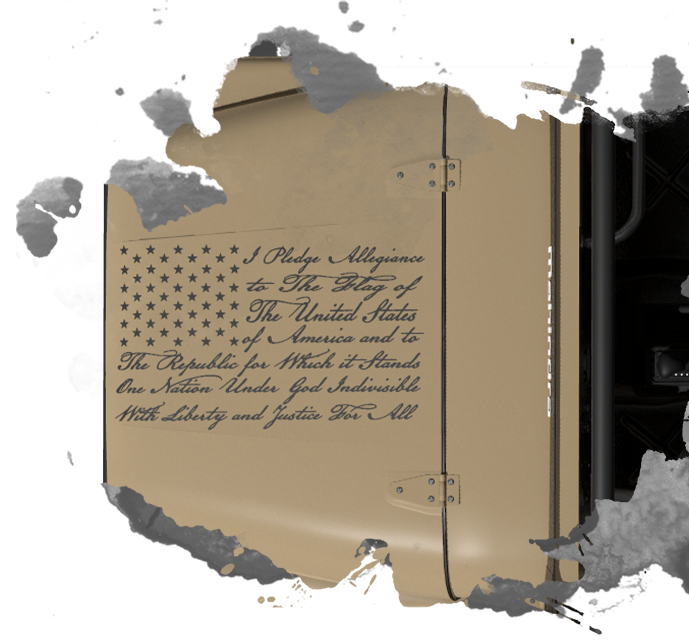 Show your pride and love of country with this hood graphic outlining the first paragraph of our Pledge of Allegiance. Accented by the stars patterned from our flag, you’ll ride with pride through the woods or in a parade. 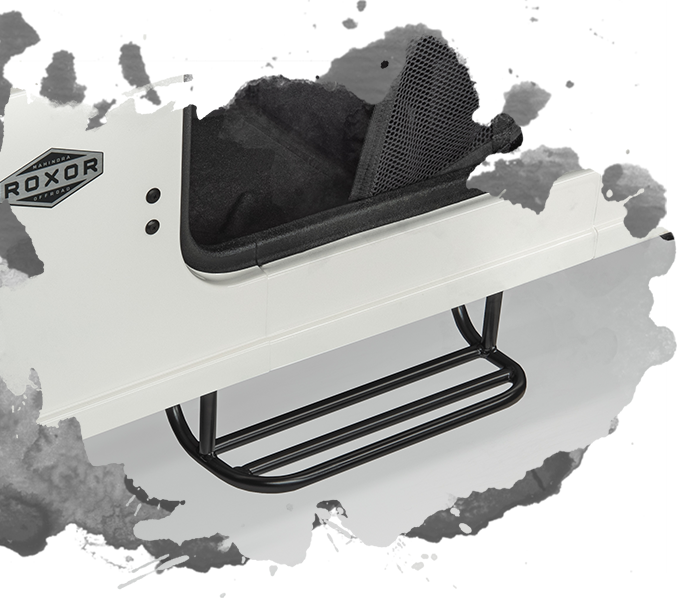 For those who may need an extra “leg up” these lightweight side-step bars require no drilling and mounting to existing holes in your ROXOR’s body. Steps (2) come in a black finish and include all necessary fasteners. You have it on your ROXOR’s tail, now add it to both sides. 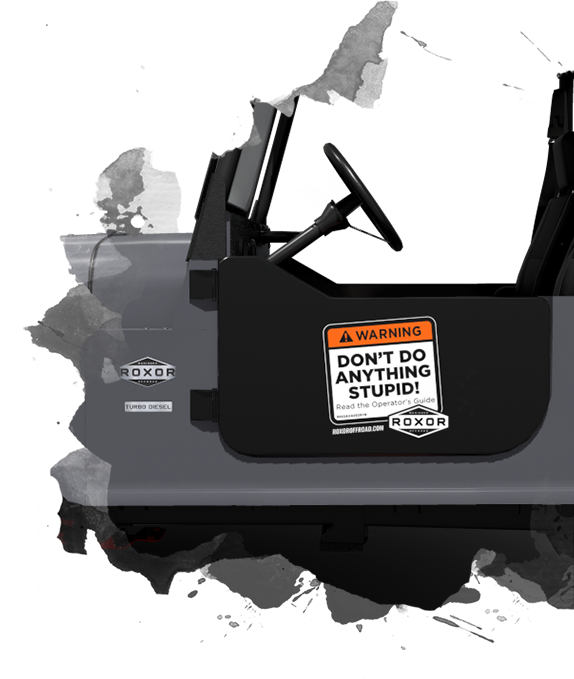 Coming and going the advice is the same, “DDAS” door graphics are made specifically for our solid half doors. Add another level of personalization to your ROXOR with our custom-fit seat covers. Initially available in black, Realtree camo and Mossy Oak camo – as shown below – these are the first in a series of replacement covers and slip covers planned for the future. Developed in our own trim shop, the covers are constructed with foam laminated, marine grade vinyl and feature pronounced inserts and contrasting stitching. The camo covers feature high-strength Cordura™ nylon fabric known for its dense weave and resistance to wear and tear and finished with contrasting stitching in black or orange. All covers come with a ROXOR badge on the headrests. Sold as a set of 2, they’re dealer install only and require the removal of existing seat covers. Installation time is approximately one hour per set. 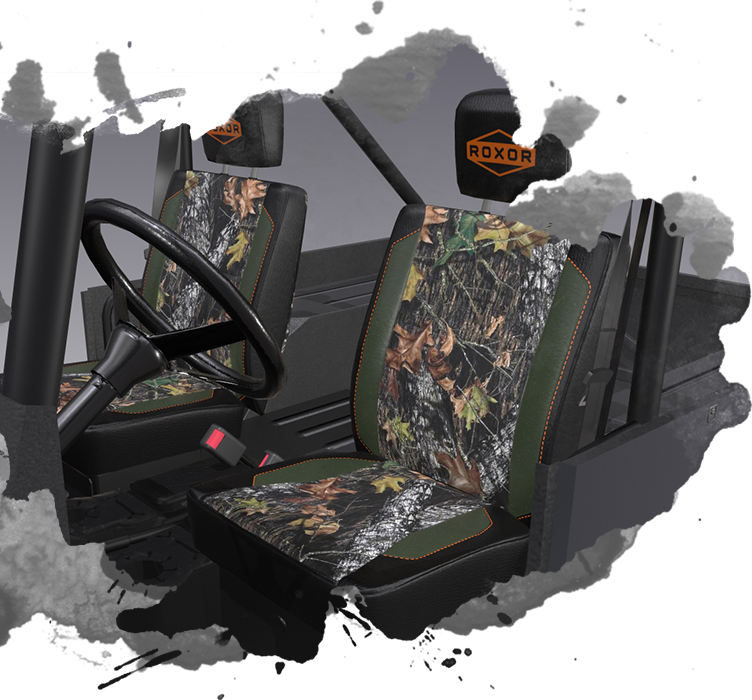 Created exclusively in house, these new graphics are a camo pattern that incorporates the ROXOR brand/logo in the design. We have created these in 4 different color variations to capture changing seasons and conditions. 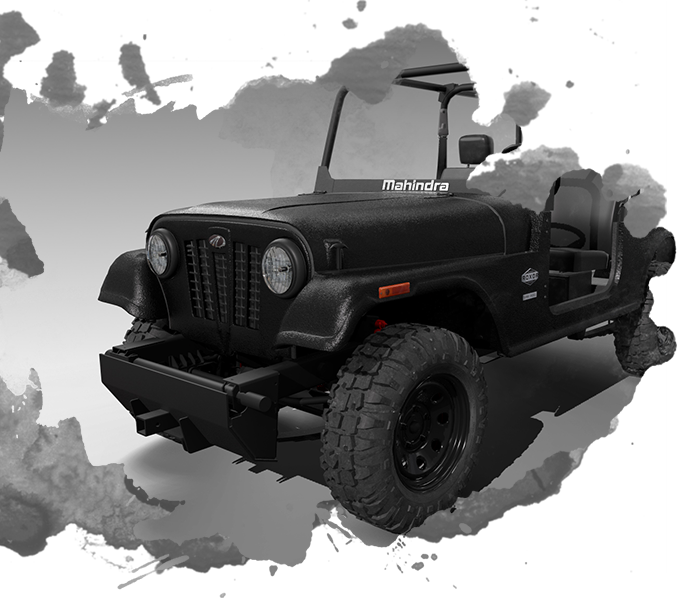 Each package is a “full wrap” consisting of 13 pieces and work best with the following body colors – matte finish recommended: Sand under Desert Sand graphics, Olive under Forest Green graphics, White under Glacier White graphics and Black under Stealth Black. 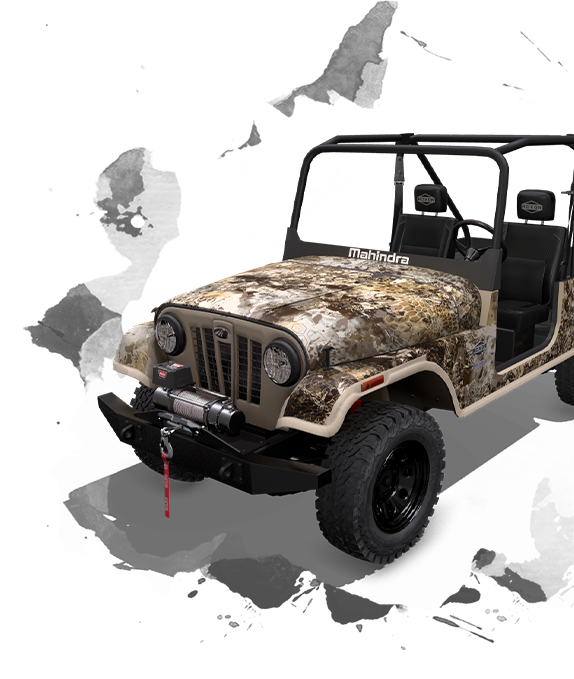 Climb inside this off-road beast and get ready for the best hunting season of your life. Whether concealed in a blind at the bank of a river or perched like a hawk at the edge of a cliff, your ROXOR will get you there. Recommended with custom olive drab or sand color.